So - if your blog surfing takes you past any 24-7 folks out there you will undoubtedly have come across this information already - however, I have been using the 24-7 spaces everyday since they came out and I love them! Fantastic little devotional podcasts that are a great way to start the day. Since I've left working in 'church ministry' it has always been a struggle to find time to do devotionals. I want to - a lot. But when you run your own company, when you're working for the man it is hard. I actually find myself wondering how guilty I made people feel encouraging them to spend time every day with the Lord when I was a pastor - because now I am not a pastor...it's freaking hard! Kids, school, bills, bookeeping - never mind the actual work. I'm lucky if I sleep! Incidentally, the challenge I find now is priorities - when I have the time, what do I do with it? 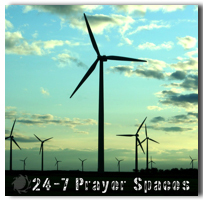 At any rate- the point of this little post is that 24-7 has launched a small devotional podcast. It is really great - so try it! You can download it from itunes.